Theoretically, I should be able to solder the Rx of the Bluetooth to the Tx on the arduino and vice versa and I should get serial communication over the Bluetooth. Of course, I do not. However, as a first question: How do I get my Arduino to transmit data over the Tx pin? However, when I plug up my o-scope, I see no signal over the Tx line. Nada. I see data coming over the USB into the COM port on my computer, but nothing over the Tx pin. How do I get the Arduino to put out serial data on the Tx pin? You appear to have a "pro micro" style board in which the USB communication is directly sourced from the main ATmega32u4 processor, rather than generated as serial data and then forwarded to a distinct USB-serial converter as on traditional Arduinos. Your question could have been resolved much more quickly if you had clearly stated the type of board you were using in words, rather than only as a product link (so I edited that into your question). The transmit data will be sourced from ATmega32u4 pin 21 which is "D1" (digital pin 1) on the headers. If you wish to probe it, that would be the best place to do so. If you wish to transmit data out of a different pin which is not connectied to the ATmega32u4's UART (as your example with digital pin 5 hints you might) you must instead use SoftwareSerial or similar implementation to bit-bang the serial data out of a general purpose I/O pin. The bluetooth board uses 3.3V, not 5V according the datasheet. So you'll need to shift the voltage level between it and the Arduino board (which is 5V). Note that the spec sheet shows how this can easily be done with 2 resistors (R1 and R2 in sheet typical application circuit, page 5). 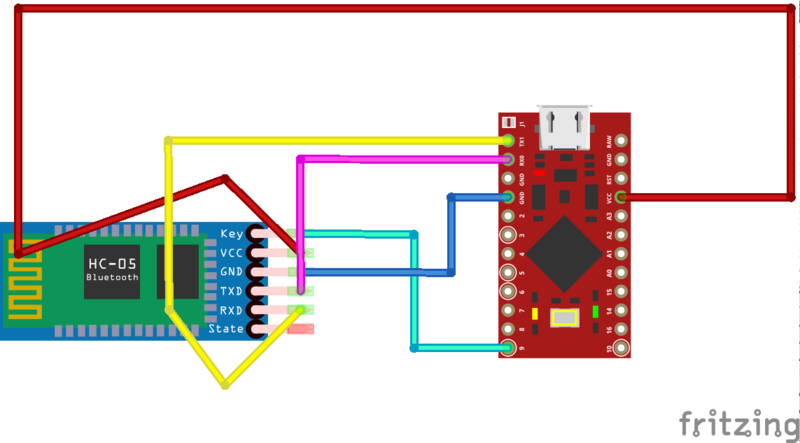 UART_CTS must be 0 to ensure the device reads incoming bytes. Normally this is done by an internal pulldown resistor, but you must ensure you did not connect that pin to +V. Finally, ensure that the baud rate of the module is properly set to 9600 bauds, the same as in your program. Just hook up the serial pins from the bluetooth module to the corresponding Pro Micro pins: TX to RX and RX to TX. I hope this can help someone. Keyboard.write(0xB2); //  Convert received code char to PC/Linux ascii keycode for the backspace key. This can change between different OS! You also may want to try the "SoftwareSerial" library. That way you can use almost any pins you want for serial comms. As a matter of fact, you can have a couple of serial ports. Please do read up on the SoftwareSerial library though. It does have some restrictions. Not the answer you're looking for? Browse other questions tagged serial arduino-pro-micro or ask your own question. Possible to use the hardware serial port for peripheral on ATmega32u4 when using USB for programming? Serial Communication to WPF (Windows Presentation Foundation) giving me odd results. How do I clear up the Strings I am receiving?